All Things Crafty: 99 Cents, Really? I happened to stop by my local Tuesday Mornings to check out their craft section. The whole time I keep saying to myself... "Trish, you do not need anymore fabric or crafts" you are trying to streamline your stuff. Then I saw it, and I blinked a few times at the prices. 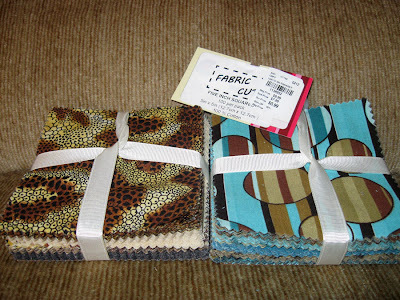 I found two very large packets of 5" squares of fabric for 99 cents each. That's right .99 each. I even asked the sales girl if it was right and not a mistake. She said it was correct. There were only two packages left and I took them both. They each have 100 squares of fabric in each package. I am hoping I can make two blankets out of the squares. One packet is browns, blacks, and tans in various animal prints and the other has teals and browns in various geometric patterns. I have found the best fabric at Tuesday Mornings and Big Lots. Here's hoping you all find the same bargains during your days browsing. I'd love to hear about the bargains you find out there! Oh wow! I've been wanting to take a drive to ours but we don't need to go that way for anything else and it's about 35 minutes from my house. I guess for that savings the gas used (and tolls on the interstate) would pay for themselves though right?